When it comes to having an encounter with history, there is no better place to see than old historic forts. The Bahla Fort, located at the foot of the Djebel Akhdar highlands in Oman, is amongst the only four historic fortresses of the area. The fort was designated the status of a UNESCO World Heritage Site in 1987 and was reopened to the public in 2012 after a massive restoration. Built between the 12th and the 15th century, the ruins of this massive fort belong to the Banu Nebhan tribe. The ruins are huge walls and towers of unbaked brick and its stone foundations that showcase a great architectural marvel of its time. Gazing and appreciating the grandeur of this fort is a memorable experience you can take on with your friends and family or even solo. How popular is Bahla Fort? 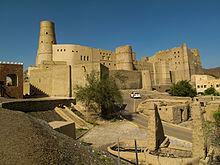 People normally club together Jibreen Hotel and Tanuf Ruins while planning their visit to Bahla Fort.